A typical IRT station in 1978 (50th Street on the West Side). Photo by David Sagarin for the Historic American Engineering Record. 2 The 1968 MTA "Program for Action"
7 The El is Falling! All "El" is Breaking Loose! It would seem, looking back, that the New York City Transit Authority didn't have a chance in the 1970s. Only 4 days into 1970, the fare was raised from 20 cents to 30 cents, with riders to Rockaway paying a double fare. The fare increase was supposed to plug up large deficits in operations, and whatever surplus was available could go to infrastructure repairs. With this fare hike, ridership declined, and this vicious cycle of fare hike / reduced ridership would repeat itself several times in the 1970s. Yet the required maintenance was never done. The rapid transit infrastructure of NYC in the 1970s was suffering from the effects of "deferred maintenance" initiatives started in the 1960s. The fiscal crisis of 1975 didn't help matters. Conditions were so deplorable that it was amazing that trains even ran. If they did run, they were dark, or completely covered by graffiti. Track conditions were horrible, too - there were hundreds of "red flag" zones where subway trains had to slow to 10mph or less. Although the R-44 and R-46 subway cars were introduced during this time, the introduction was extremely problematic. The R-44s were plagued with problems in its advanced circuitry. The R-46's untested Rockwell International trucks began cracking, forcing them to run during rush hours only. The subway cars that were supposed to be replaced by the R-46s, the R-16s, were taken out of mothballs to replace the R-46s instead - how ironic! Even labor / management relationships suffered, with strikes threatened every two years. In 1980, there was a 12-day subway strike, the first since 1966. In the 1980s, things became brighter, literally. New stainless steel subway cars, the R-62(A)s for the IRT and the R-68(A)s for the BMT/IND Divisions, began running. After a so-so start, they have proven themselves very reliable. The IRT Redbirds, from class R-26 up, went through a general overhaul program (GOH) and were retrofitted with new components, a new paint job, and air conditioning. The existing BMT/IND equipment at the time, from car class R-32 and up, was also taken through a GOH program, and those cars that were originally manufactured without air conditioning received it. The R-30s were given a light overhaul, but did not receive air conditioning, because they would have become too heavy. The MTA embarked on the first of what became many capital plans, bringing the subway to a state of good repair. Mean time between failure (MDBF) measurements began to improve markedly, and continue to improve to this day. Graffiti was finally eradicated from all subway cars by the end of the decade (though it has been replaced by "scratchitti" in the 1990s). In the 1990s, MetroCard debuted, putting the token on borrowed time. With MetroCard Gold, dual fare zones (bus to subway transfers) were eliminated and ridership increased markedly. Unlimited ride MetroCards were introduced, including the railfan friendly $4.00 Fun Pass, though you had to go outside the system to purchase one, until a MetroCard vending machine was installed in your station. The New Technology Trains, the R-110A and R-110B, ran on various lines for several years, testing and refining technology that would become essential componentry of the new R-142(A)s and R-143s that were delivered in the first part of the 21st Century. Many stations were completely rehabilitated and others are undergoing renovations today. The subway system is in remarkably good shape compared to the way it was in the 1970s. The Virginia Slims cigarette commercial used to say, "You've Come a Long Way, Baby", and this saying could also apply to NYC Transit. This is the story of the NYC Transit, then known as the Transit Authority, during the 1970s. It marked the first decade in the history of the subway system that real, physical mileage was lost and not replaced. No new extensions or lines were built, but the 3rd Avenue El in the Bronx, the Culver Shuttle in Brooklyn and the Jamaica Avenue El in Queens north of Queens Blvd closed, with no rail lines replacing them. This document will examine the grand plans put forth by the Metropolitan Commuter Transportation Authority (MCTA), the predecessor to the Metropolitan Transportation Authority (the MTA), at its formation in 1968. Most of these plans affected the subway system. During this time, the Transit Authority (the TA) was placed under the umbrella of the MCTA whereas before it was its own agency reporting to no other entity. We will then compare the 1968 plan with what actually occurred over its first seven years. We will then examine the state of the Transit Authority and its subway system in the late 1970s. We'll wrap up with a list of incidents and accidents that were newsworthy during the 1970s, and list some "odds and ends" that didn't fit "nicely" in the text below. The 1968 MTA "Program for Action"
Phase I considered projects for immediate action and would run over a ten-year period costing $1.6 billion. Phase II was to be carried out at the completion of phase I, at an estimated cost of $1.3 billion, most of which would come from the Federal Government. The plan considered all aspects of regional travel, affecting the subway, the LIRR, the Penn Central, Erie-Lackawanna and New Haven railroads, as well as the regional airports. Aggressive completion of the 63rd Street tunnel (at the time this project was already planned) as well as the connections to the IND 6th Avenue Line and the BMT Broadway Line. This line would reduce overcrowding on the IND Queens Blvd line, through the 53rd Street tunnel, on the IRT Flushing Line and through the 60th Street tunnel. The connections planned with the Second Avenue subway would allow direct access to the West Side for Pelham Bay Park riders. A super-express bypass for the IND Queens Boulevard Line. It would leave the IND Queens Blvd line at 41st Ave. near the Sunnyside Yards, run along the LIRR main line and return to the Queens Blvd. line in Forest Hills. This one-track line would provide additional express service in the peak direction, and would have no stops between Queens Plaza and Forest Hills. It was felt that construction of this line would double rush-hour capacity along Queens Blvd. A new subway line would diverge from the IND Queens Blvd. line in Elmhurst, Queens and run along the Long Island Expressway to Fresh Meadows, serving northeastern Queens. This would be a two-track line that would serve Lefrak City, Fresh Meadows, the Pomonok Houses and Electchester, as well as Queens College and St. John's University. A new subway line would diverge from the IND Queens Blvd. Line at the Van Wyck stub at Hillside Ave. and run along the LIRR Atlantic Branch ROW to Springfield Blvd, serving southeast Queens. This line would be two tracks, and would include a new station adjacent to the LIRR Jamaica station that would serve as a transfer point between the LIRR, this subway line and JFK airport trains. The line would serve the large-scale housing development at Rochdale Village. (This line was actually built as far as Parsons Blvd. and Archer Ave., the terminal of today's E, J and Z trains, and opened in 1988). The Second Avenue Subway from 34th St to the Bronx, with a connection to the 63rd St tunnel. The portion of the line from 63rd St, Manhattan to 138th St, the Bronx, would be built as two tracks, with provisions to expand it to four tracks "easily". The Brook Avenue station would be reconstructed to allow a cross-platform transfer between Second Avenue and Lexington Avenue trains. The line would continue from 138th St along the ROW of the former New York, Westchester, and Boston Railway to Dyre Ave. The stations along the Dyre Ave. line would be restored to their original widths (they were "expanded" somewhat to accommodate IRT trains). The junction at East 180th Street, as well as the approach of the IRT White Plains Road Line to East 180th St would be reconstructed to allow cross-platform transfers between White Plains Road and Second Avenue trains, as well as remove the sharp curves along that area of the line to improve travel times. There would be a connection with the IRT Pelham line at Whitlock Ave. and stations would be shaved back for the larger IND/BMT subway cars. The IRT Pelham Line would terminate at Hunts Point Avenue. Second Avenue trains, like today's White Plains Road line above 180th Street, would have two branches - one to Dyre Avenue, one to Pelham Bay Park. In conjunction with this project, the sharp curves connecting the Lexington Avenue Line to the White Plains Road line at 149th Street and the Grand Concourse would also be eliminated. The New Lots Ave. line would be extended southerly to Flatlands Ave. and Linwood Street. The intent was to have this extension serve the growing Spring Creek area. The line would run at ground level. In conjunction with this and the IRT Nostrand Ave. line extension, the Rogers Ave. junction would be reconstructed to increase capacity. The purchase of about 500 high-speed air-conditioned subway cars for operation on the new subway extensions. These subway cars would eventually become the R-44 and R-46. The Staten Island Rapid Transit would be rehabilitated from end to end. It would be the first major rehabilitation project on the SIRT since 1925. It would get new cars to replace the "BMT Standard look-alikes" that had run on the line since the mid-1920s. A new "Metropolitan Transportation Center" at 48th Street and 3rd Avenue would be built to provide a terminal for the new LIRR line that would use the lower level of the 63rd Street tunnel. It would also have a terminal for a proposed new high-speed line to JFK Airport that would run via Jamaica. It would be a transfer point between the Lexington Avenue and Second Avenue subway lines. Access to Grand Central Terminal would be provided through a new north end access point. Construction costs would be offset by building office space above the transportation center. The layout of the subway station beneath the center would be similar to that of West 4th Street on the IND, except the mezzanine would be above the two track levels instead of sandwiched in between them. A midtown distribution system along 57th, 48th, 42nd and 33rd Sts., using some kind of guided systems technology to link terminals, offices and other travel points. One guided system under consideration was the same proposed as a replacement for the 42nd Street shuttle back in the 1950s. Extension of the subway east of Jamaica to Hollis, Queens and razing the El along Jamaica Avenue. Extension of the new northeast Queens subway line to Springfield Blvd. The purchase of an additional 500 new air conditioned high speed subway cars. Extending the LIRR from the Flatbush Avenue terminal into lower Manhattan. A new railroad station at 149th Street in the Bronx to provide a convenient interchange between the Penn Central, the New Haven and the subway system. Some revisions to the plan that were approved by the Board of Estimate in May 1968 were a new IRT Utica Ave Line to Kings Highway (later Flatbush Avenue and Avenue U) extended from the IRT New Lots Ave Line, extension of the IRT Nostrand Ave Line along Nostrand Ave to Ave W in Sheepshead Bay (instead of Flatbush Ave to Ave U as originally proposed) and the relocation of the Canarsie Line (open portion) to the LIRR Bay Ridge Line cut. Stations proposed for the Utica Avenue line were (on Utica Avenue) Winthrop Street, Church Avenue, Kings Highway, Flatlands Avenue, terminating at Avenue U and Flatbush Avenue. Construction on the Second Avenue Subway began on October 27th, 1972, when both the mayor and governor broke ground for the new line at East 103rd St. and Second Avenue. A second section between 110th and 120th Streets was also started. The stations originally planned for in Manhattan were 125th Street, 34th Street, Houston St. and Wall Street. Opposition to such few stops forced compromises and additional stops were planned for 106th St., 96th St., 86th St., 72nd St., 57th St. and 48th St. The number of stops added negated the possibility of expanding the line to four tracks in the future. South of 34th St., the plan for a straight run down Second Ave., Chrystie St., the Bowery, Pearl and Water Streets, drew opposition from residents east of Second Ave. who felt that the line would not serve them well. In January of 1970, the Board of Estimate revealed a new plan for the area - a loop line that would run as follows: southbound IND trains would leave the IND Houston Street line and run east to Avenue C, north to 14th Street and west along the current tracks of the BMT Canarsie Line terminating at 14th St / 8th Avenue. This became known as the "Avenue C Cuphandle". On July 25th, 1974, construction began on the section of the Second Avenue Subway between 2nd and 9th Streets in the East Village. The 63rd Street tunnel was designed to accommodate subway trains on the top level and LIRR trains from Sunnyside Yard on the lower level. Construction of this joint facility was considered "innovative" in its time. LIRR trains would then turn south around 3rd Ave. and run to the proposed Metropolitan Transportation Center (MTC) in the vicinity of 48th St. and 3rd Ave. The MTC would facilitate easy intermodal transfers between the LIRR, the Second Avenue line, the IRT East Side Line at Grand Central as well as Grand Central Terminal. The double-deck, 3,140-foot tunnel under the East River was holed through on October 10th, 1972. Work began on the segment of the 63rd Street line that ran under Central Park in the summer of 1971. By June 20th, 1973, this portion was completed and the area of Central Park above this portion became a children's water playground, and was turned over to the NYC Parks, Recreation and Cultural Affairs Administration. On August 30th, 1974, construction began on the section of this line between 5th Avenue and Park Avenue. The 63rd Street "Tunnel to Nowhere" in a 1976 view. Photo by George Cuhaj. Construction on the Archer Avenue subway began on August 15th, 1972, at Archer Avenue and 151st Street, paving the way for the southeast Queens subway line and the demolition of the Jamaica Avenue El from 121st Street to 169th Street. New subway cars, the R-44s, were designed and built in anticipation of running 70mph trains under 2nd Avenue. The MTA actually announced a plan for 80mph trains, but it was reduced to 70mph because the TA didn't want to consider a new, lightweight truck to enable these speeds. (It should have listened to itself when the R-46 car order was placed). The R-44 contract was assigned to St. Louis Car in January of 1970. The new cars would have automatic speed control and were planned for one-person train operation. On October 5th, 1971, the first R-44 test train ran to 57th Street / 6th Avenue for public display. It was tested on the A, D, E and F lines. On January 31st, 1972, a speed record of 83mph was obtained during tests on the LIRR. Legend has it that half the motors burned out after that record-shattering run. On February 28th, 1973, the first R-44s were placed in service on the Staten Island Rapid Transit. When the R-44s initially entered service, failure rates increased tremendously because of a combination of new technology and inadequate training. Two early views of the R-44 trains. Left: Car 262 and mates speed testing on the Long Island Rail Road at Forest Hills, November 1972. Right: In service at Far Rockaway, January 1972. Both photos by Doug Grotjahn, collection of Joe Testagrose. How "substantial" was the progress made on subway related projects? Three new subway lines were under construction (63rd Street, Second Avenue, Archer Avenue). 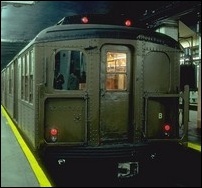 800 new R-40 and R-42 subway cars were placed into service. This was in the five-year checkpoint even though it wasn't part of the "Program for Action". In 1968, 27% of the fleet was considered to be beyond retirement age ("30 years if a subway car is properly maintained"); in 1973, this was reduced by half to about 14%. While this seems impressive, it is less so when compared by number of subway cars. In 1968, there were 6,975 subway cars in the fleet, of which 1,883 were beyond their useful lives. In 1973, there were 6,826 cars in the fleet, of which 956 were beyond their useful lives. The report also did not consider the effect of deferred maintenance, which would catch up with the Transit Authority in a big way later in the 1970s. The first 8-car train of R-44s was placed into revenue service on December 16th, 1971 on a one-month trial. The first train of R-44s in "permanent" revenue service left 179th Street - Jamaica on the "F" train on April 19th, 1972. 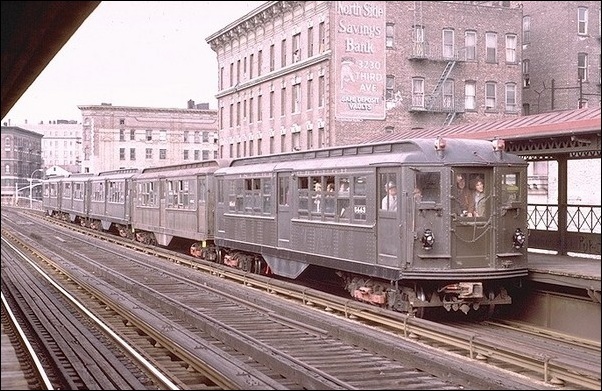 By 1973, 300 R-44s were placed in service and 745 R-46 subway cars were ordered from Pullman Standard (and this would increase slightly to 754 cars). 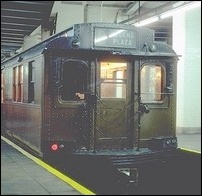 Pullman hadn't built a subway car for New York City since 1938. After the R-46 order, they would never build a subway car for New York, or anyone else, ever again. The first four R-46 cars would be delivered on March 27th, 1975, and would be tested on the express tracks of the Sea Beach Line. The first R-46 train went into revenue service on July 14th, 1975. 1,137 new buses were placed in service with another 333 ordered for delivery in 1973. Again, this was in the five-year checkpoint even though it wasn't part of the "Program for Action". IRT Bowling Green Station modernization and expansion. This project started on July 19th, 1972 to relieve overcrowding as a result of new office development in the area. BMT 49th Street modernization, to be completed in 1974. IRT 50th Street station design, to be completed in late 1973. 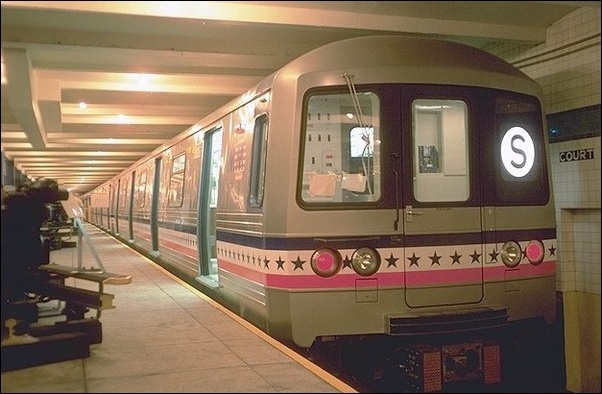 50 BMT stations had their platforms extended (or were currently being extended) to accommodate 10 cars. Projects to figure out how to air condition IRT cars were started. Two IRT cars completed a two-year air conditioning test on September 5th, 1973, and the first two 10-car IRT trains retrofitted with air conditioning entered service on June 24th, 1975. On June 15th, 1972, the SIRT placed three of five borrowed air-conditioned LIRR cars built in 1955 into service to keep service going until the R-44s would arrive. The SIRT hadn't seen a new car purchased since 1925! It finally received 52 new R-44 subway cars, the first of which went into service on February 28th, 1973. With the arrival of the R-44s, the LIRR cars were removed in late April. Improvements to four electrical substations were made. Plans to build two additional substations were put into place. 6 extensions to existing platforms were underway in 1973. Eight stations received new lighting. The SIRT was considered to be in the worst physical condition of any facility ever taken over by the MTA. 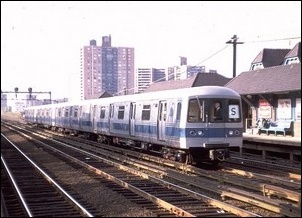 The subway and commuter rail cars ordered during these 5 years had a distinctive "MTA look", with a common front end, and all cars had a silver finish with a blue stripe along the beltline. In 1972, tolls along all Triborough Bridge and Tunnel Authority crossings were raised and the additional funds produced by the toll increase were split between the subway and the commuter rail lines 50-50. On January 28th, 1973, Mayor Lindsay and MTA Chairman William Ronan announced plans to air-condition "all existing subway cars" by 1980. The mayor and chairman likely never rode an R-10 under 8th Avenue! Perhaps they figured these models (as well as any model below R-22 on the IRT and R-27 on the IND/BMT) would be replaced by then. Also on the same day, the Transit Authority started a new marker light system. The marker lights would distinguish the destination only, not the train's origin or whether it was running local or express. In later years, trains would lose the destination signs in front, showing just a letter or number. In 1973, the northeast Queens line to Kissena Blvd was approaching final engineering. The southeast Queens line connecting to the Jamaica Avenue line was close to having a final design approved. Design was coming along on the extension of the Nostrand Avenue IRT line to Avenue W, and the new line leaving the New Lots Avenue line at Utica Avenue, running along Utica Avenue to Avenue U. People mover studies for 48th Street and lower Manhattan were underway. Plans to extend the Second Avenue subway into the Pelham Line were changed to extend it to Co-op City via the New Haven Railroad right of way. On December 16th, 1973, the Sunday half fare program was introduced. It was valid on subways and buses from 6AM Sunday until 1AM Monday. The intent was to lure drivers back to mass transit during the energy crisis. The 1970s also brought some major service terminations, three of which were part of the "Program for Action". The IRT Low-V museum train (before there WAS a Transit Museum) on a fan trip on the 3rd Avenue El April 29, 1973, one day after the El ceased revenue service. Photo Gerald H. Landau, collection of Joe Testagrose. In August of 1972, MTA Chairman William Ronan announced plans to discontinue service on the Third Avenue El in the Bronx during the summer of 1973. And so it was to be, but sooner than expected. The last elevated line that could trace its history back to the Manhattan Els, the Third Avenue El in the Bronx, was closed for good on April 29th, 1973. It carried over 158 million passengers in 1917; when it closed, it carried just under 6 million yearly passengers. It was replaced by Bx-55 bus service. The last revenue train to leave Gun Hill Road departed at 11:42pm, and the last revenue train to leave 149th Street / 3rd Avenue departed at 12:06am April 29th. The ERA conducted a fantrip over the line on April 29th, so the last train to carry passengers of any kind departed 149th Street at 4:50pm arriving at Gun Hill Road at 5:46pm. Work trains would continue to use the line into the summer performing salvage operations. Demolition of the structure began on January 2nd, 1974. The section between 149th and 161st Street remained until a new substation could be built for the White Plains Road line that passed underground in that area. This substation was completed on October 17th, 1975 and demolition of this final section of the 3rd Ave El began on March 9th, 1977. The lower level of Gun Hill Road would be retained for several years for reverse moves and layups. Some of the original station signs and wooden platforms existed on the lower level until approximately 1998. The remains of the 3rd Avenue El at 149th Street, in December 1973. Photo by Jack Boucher for the Historic American Engineering Record. On August 28th, 1972, the last grade crossing on the New York subway at East 105th Street on the Canarsie Line was eliminated. 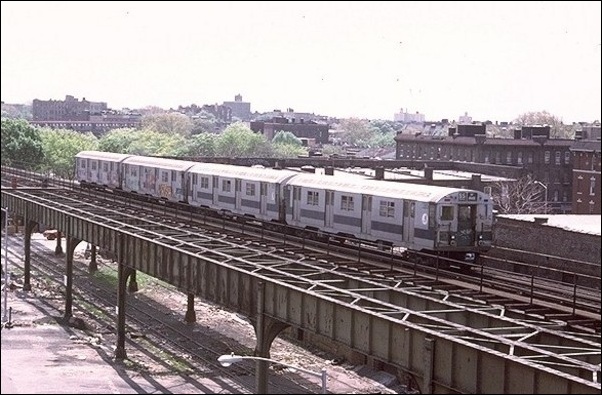 On May 11th, 1975, the 1.1 mile Culver Shuttle between 9th Avenue / 39th Street and Ditmas Avenue in Brooklyn, was terminated. The Culver Line had been reduced to a 2-track shuttle between these stations on May 28th, 1959. On December 12th, 1960, a snowstorm reduced capacity to a single track, and it was decided to keep the line as a single-track shuttle on December 29th, 1960 because the line had very poor ridership. A derailment that occurred a few months before termination revealed poor track conditions that would cost the TA nearly $1 million to repair. As the line was very lightly used, the TA chose not to repair the line, and to close it down. The last revenue train left 9th Avenue at 11:54pm on May 10th and left Ditmas Avenue at 12:01am May 11th arriving at 9th Avenue at 12:06am. Replacement service would be provided with free transfers to the B-35 bus. Oddly, the structure would not be torn down until the late 1980s, and the right of way under which this portion of the line ran would remain intact until the late 1990s. The end of the Culver El was not part of the "Program for Action" but a victim of service cuts made to try and keep subway service afloat in the midst of the 1975 fiscal crisis. After abandonment, a dozen R-27/30s reserved for use on the Culver Shuttle were converted "to normal" to run with other cars of its type. These dozen cars were modified to run only in series while in shuttle service. The sad final days of the Culver Shuttle. Reduced to one track, a solitary train of R-27/30 cars shuttles back and forth in this view, May 1975. Doug Grotjahn photo, Joe Testagrose collection. On June 14th, 1974, MTA Chairman Yunich and Mayor Beame announced plans to discontinue service on the Jamaica El north of Queens Blvd sometime in 1975. Service would end even before construction of the Archer Avenue line was completed. Bus service would take over in the affected areas. On February 13th, 1977, the Bowling Green - South Ferry Shuttle was discontinued. The last train left South Ferry at 12:10am and arrived at Bowling Green one minute later. On September 10th, 1977, the Jamaica Elevated was permanently closed between Queens Blvd and 168th Street. The last revenue train left 168th Street at 12 midnight. Oddly, it was the politicians and the businesses in the area that wanted the El closed before the Archer Avenue subway would open. The TA really wasn't interested in tearing it down. In fact, on September 20th, the TA ordered demolition of the structure to stop and they wanted to determine the cost of restoring the service. The moratorium didn't last long, for demolition was resumed in October. Ironically, Macy's announced the impending closure of their Jamaica store shortly after El service ended. The rustic appearance of the 168th Street station in Jamaica, Queens, New Years' Day 1977. By September the Lowes' Valencia would be gone as well. Doug Grotjahn photo, Joe Testagrose collection. 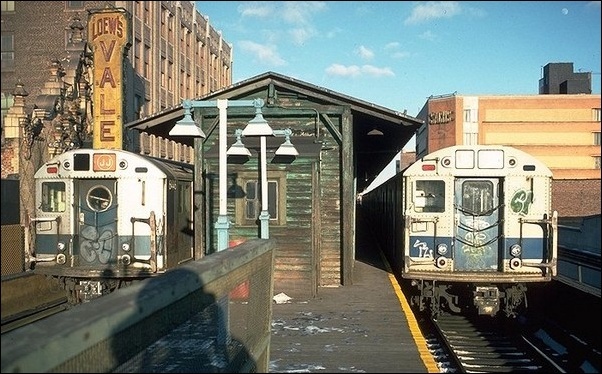 On March 31st, 1977, the last revenue train of R-1/9 cars left 168th Street / Jamaica on the J line at 8:01am, arriving at Broad Street, Manhattan at 8:55am. It then ran light to Coney Island yard to be scrapped. On September 11th, 1977, two post-abandonment fantrips were run on the Jamaica El using D-Types and AB standards. The Utica Avenue Line, the Nostrand Avenue extension of the 2/5 Lines, the subway along the Long Island Expressway to Kissena Blvd and the LIRR East Side Terminal - 1993. The outlook for the "Program for Action" seemed very rosy. But storm clouds were brewing on the horizon. The debut of the R-44s was filled with problems; so many in fact, that St. Louis Car, the R-44's builder, was unable to bid on the R-46 order that eventually went to Pullman Standard. Wiring problems with a "P-wire" plagued the cars for months after initial delivery, stalling trains. 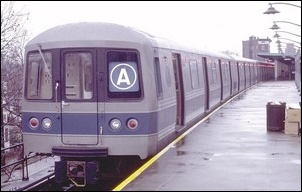 On April 20th, 1974, state comptroller Arthur Levitt released a report detailing the breakdown rate of R-44s (3 times higher than all other subway car classes at the time) and suggested that the TA sue St. Louis Car to recover the money spent trying to resolve the problems. Three views of the R-44s in the 1970s. Left, a nearly new R-44 at Pleasant Plains heads south to Tottenville on the Staten Island Rapid Transit line. Center, where the R-44 fleet would spend most of the 1970s: in the shop. Right, some of the cars wouldn't even survive to be overhauled. Here's car 288, involved in a collision in 1974 it sat idle til being scrapped in 2000. Photos: left: collection of David Pirmann; center: Richard Short, collection of David Pirmann; right: Trevor Logan. In 1972, the planned extension to northeast Queens along the Long Island Expressway was "deferred". In 1973, the graffiti epidemic exploded. Some progress was made in combating it in late 1973, but in the winter, the car-washing program stopped. In September of 1974, exterior washing with an acid solution resumed, but there was little noticeable effect. On April 18th, 1974, MTA chairman William Ronan resigned his post to take over the Port Authority of New York and New Jersey. David L. Yunich, former vice chairman of the Macy's department store chain, took over as chairman on May 2nd. Yunich resigned the chairmanship on December 30th, 1976, expressing a desire to go back into private business and was replaced on April 1st, 1977 by Harold L. Fisher. The New York City Transit System played host to the Urban Mass Transit Administration's State-of-the-Art car (or SOAC). The SOACs were built by St. Louis Car and looked very much like R-44s (and in fact were based on the R-44 car body.) Before they ran in regular service on various transit systems in the US, they were involved in a mishap on August 11th, 1973, in the DOT Test Center in Pueblo, CO. The train traveled through an open switch, crashed into standing freight cars and killed the motorman. The cars were badly damaged, and because St. Louis Car was out of business, it wasn't clear how the SOAC cars would be repaired. They were eventually repaired, and delivered to the TA on April 18th, 1974. Regular service with the SOAC cars began May 17th, 1974 during the mid-day hours, and the cars ran on the A, D, E and N lines through July. The SOACs then went on to visit Boston on July 23rd. After Boston, the set visited Philadelphia and Chicago. 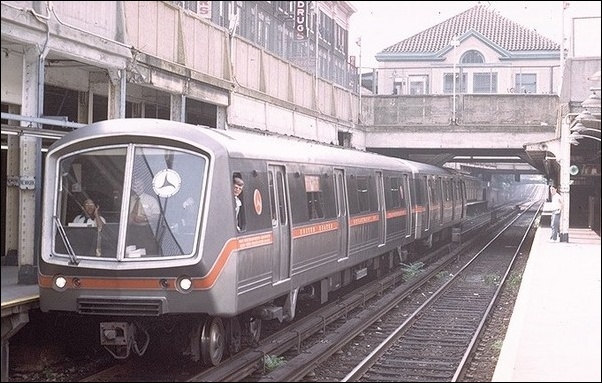 The futuristic "SOAC" train in service at Newkirk Avenue on the Brighton line, July 1974. Photo by Joe Testagrose. Rebuilding a collapsing section of a retaining wall on the Sea Beach Line between Ft. Hamilton Parkway and New Utrecht Avenue. At times, trains were rerouted to the express tracks to avoid vibrations in the area. Another branch off the Queens Blvd IND line at 63rd Drive to Rockaway (the very same branch proposed in 1929 and 1939). Finally, in April of 1975, due to the City's fiscal crisis and the need to maintain the existing infrastructure, the Second Avenue subway construction was stopped. The sections actually finished (completed tunnel, no track) are from the Bowery to Chrystie Street, East 2nd to East 9th Streets (filled back in), East 99th to East 105th Streets, and East 110th to East 120th Streets. Former head of the MTA William Ronan complained in an article written for the Journal of the Institute for Socioeconomic Studies of White Plains that one of the major problems with getting transit improvements done in New York City was that the public had too much to say about them. By June of 1975, ridership had fallen to levels not seen since 1918. The TA was considering drastic cutbacks in late night service to make up the lost money from fewer fares. However, New York's fiscal crisis meant that it couldn't increase its TA subsidy, so on September 1st, 1975, the fare rose from 35 cents to 50 cents with no change in the subway token. The Add-a-Ride ticket was established at 25 cents. This ticket could be used on intersecting bus lines where no free transfer was issued. When the half fare program was in effect, this ticket cost 10 cents. The 50-cent fare also ushered in the elimination of the only double fare zone on the subway for passengers traveling south of Howard Beach in Queens. Yet still more cuts were made, such as the closure of part time token booths, consolidation of existing subway lines, discontinuing lightly used lines and the consideration of closing the subway during late night hours. The latter didn't go over well with politicians, and they demanded an audit of MTA operations to find areas where costs could be saved. In January of 1977, to both save money and increase safety, subway trains were shortened during off hours. By October of 1977, the planned Metropolitan Transportation Center at 3rd Avenue and 48th Street was dropped. LIRR trains using the 63rd Street tunnel would run to Grand Central, whenever that line would be built. $63 million had been spent on 2nd Avenue Subway construction through December of 1978. Work on the 63rd Street Tunnel (soon to be called "the tunnel to nowhere") managed to soldier on, too. The El is Falling! All "El" is Breaking Loose! Or so it seemed. The frequency of reports about "shrapnel" on Els raining down onto city streets grew in the late 1970s. One individual in the shadow of the Astoria El displayed for the New York Post a collection of assorted doo-dads that came down from the line as trains passed over it. In January of 1979, another individual was nearly killed while walking under the Pelham line between Zerega and Castle Hill Avenues as debris from the structure rained down on him. In September of 1979, multiple claims of "stuff falling from the (West End) El" along New Utrecht Avenue led attorneys for a Bensonhurst anti-noise group called the Big Screechers and State Senator Martin Solomon to file suit against the Transit Authority to fix the structure. While Brooklyn Supreme Court Justice Arthur Hirsch agreed with the plaintiffs that the West End El was in bad shape, he dismissed the suit because the Court was powerless to dictate repair priorities to the TA, which said that a repair program on the El was already underway. Trains were taken out of service very often, usually because the motorman lost indication that the doors were closed and locked. It happened so often, in fact, that riders began revolting and refused to leave the trains. Many times, the riders won. If it wasn't a shrapnel or out-of-service complaint, it was noise complaints. "85% quieter subways promised by 1985", screamed a Daily News headline in 1977. A $62.5 million track welding and wheel-truing program would be underway to reduce noise on the subway. "Don't bet on it", screamed residents living on Crescent Street and along New Utrecht Avenue, both in Brooklyn. The sharp curve of the J line at Crescent Street was a frequent source of complaints. Lubricating equipment placed on the curve repeatedly malfunctioned. Meanwhile, the Big Screechers measured the decibel level of the B train along New Utrecht Avenue at 116 decibels. The group's president indicated that the Concorde was measured at a lower 112 decibels. The cause of this loudness was most likely flat wheels which were abundant in the deferred maintenance era. The brand new R-46 models, like their R-44 brethren, were plagued with problems from the start. There were reports circulating in the news media that the TA would cancel the R-46 contract and accept only the 200 that had been built as of December 1975. The performance of the R-1/9 cars, themselves plagued with problems at 40+ years of age, was better than the several month-old R-46s. Even the US General Accounting Office criticized them indirectly, by blaming the Urban Mass Transportation Administration for approving subsidies for these cars without having monitored their reliability and performance. Even when new construction was going on, the MTA didn't have it easy. Manhattan residents at the vicinity of York Ave and East 63rd Street protested over the MTAs intention to build a ventilation shaft for the 63rd Street subway. Residents didn't trust the MTA, thinking the ventilation shaft would eventually become a construction shaft for the ingress and egress of construction vehicles. The people thought they'd get a different kind of shaft! Parts of existing lines were not holding up too well either. On October 27th, 1976, loose chunks of concrete were falling from a retaining wall on the southbound side of the Brighton Line at a point just south of the Beverley Road station. After a series of temporary reroutes, and bi-directional running on the Manhattan-bound express track, the southbound track alignment had to be changed. Starting November 1st, all trains ran express to Church Avenue, and then continued along the express track to a point just south of the problem. The track then switched to the local side (severing the express track and the local track at that location), where all trains continued making all local stops to Kings Highway. By December 13th, a PM rush hour shuttle train consisting of R-42s was put into service to serve the Beverley Road station. It ran between Prospect Park and Beverley Road. This service pattern continued until February 14th, 1977, when the local track was restored. The express track was restored on February 25th. There were 11 "crimes against the infrastructure" in open cut areas of the subway in 1977. One incident on October 5th, where a miscreant threw a paving block from an overpass on the Brighton Line, injured a motorman. The injury resulted in numerous operations to save his eyesight. Another incident on May 11th, 1979 on the LL Canarsie Line occurred when a 16-year-old boy threw a 16-pound rock over a fence separating the line from the LIRR near the Wilson Ave station, critically injuring the motorman. Ridership dropped by 25 million passengers between June 30th, 1976 and June 30th, 1977, continuing an eight-year decline that saw 327 million passengers leave the system. An analysis of trends at that time forecast that if this rate of decline would continue, there would be no passengers on the system by 2002. As a result of declining ridership, the number of subway cars used during the morning rush dropped from 5,557 in 1974 to about 4,900 in 1978. Oddly, the biggest rush hour cuts made between 1974 and 1978 were to the Queens Blvd lines, which were always terribly crowded to begin with! Headways were increased, too, so people were waiting longer periods of time for shorter trains that were intensely crowded. Unfortunately, there were other rampant crimes, too. In the first two weeks of December of 1977, "Operation Subway Sweep" resulted in the arrest of over 200 robbery suspects. Passengers were afraid of crime, fed up with long waits for short trains (train lengths were cut during off hours as a cost saving measure), upset over malfunctioning equipment, noise and the condition of stations. Even with another infusion of $800 million of state funds promised in 1978, less than half of the $600 million authorized in the 1967 bond issue for major construction had been spent! New Yorkers' attitude towards the subway was that it was a 19th century relic barely adequate for the 20th century, let alone trying to get into the 21st! The Transit Authority really wasn't idle during this period; much of the improvements being made were being done to parts of the infrastructure people don't see: tunnels, tracks, switches and signals. It had to do this with a smaller amount of funding than available in the past due to the fiscal crisis, and keep the subway operating 24 hours a day. However, it had a major public relations problem. People didn't "see" any improvements, so they assumed that none were being made. People assumed that crime was out of control, and for a while it was, but this assumption was maintained even during periods of reduced crime. There are people to this day who assume that the subway is a filthy, crime infested rat hole. If the El wasn't falling, the lights were going out. Many trains had dark cars, and it wasn't rare to have a train with 1/4th of its cars dark. Then on July 13th, 1977, everything went dark. A blackout caused by multiple lightning hits on a main transmission line near the Indian Point Power Plant knocked all of New York City (except the Rockaways) and Westchester into darkness. Because some of the power plants from the IRT and BMT days were still operational, many IRT and BMT trains were able to make their way to the nearest station to discharge passengers. The IND didn't fare so well, because the IND always got their power directly from Con Edison. Widespread looting in parts of the Bronx and Brooklyn, especially along Brooklyn's Broadway El, didn't spread to the subway lines, but to this day, parts of the affected neighborhoods never completely recovered from the looting. The subway fare in 1978 was 50 cents, and always a political hot potato. No politician would support a fare increase. But the "saved" fare would continue to have long-term repercussions on the transit system. Estimates of $1 billion a year for ten years would be the price tag to bring the system back to a state of good repair, but without a fare increase, and New York City in a fiscal crisis, where would this additional money come from? Hopeful eyes turned to a larger piece of the federal pie and increasing ridership as the tools to dig out of the mess the subway was in. TA management felt that ridership levels were tied to the prevailing economic conditions, and didn't consider that improvement of services could bring in new customers. They felt helpless in changing the ridership situation. In October of 1978, Mayor Koch was ridiculed by the New York Post for praising the job that Harold L Fisher was doing. The Post cited deplorable noise conditions, overcrowding and lack of air conditioning. "If our subways were under military jurisdiction, no one would be allowed to enter without protective ear coverings", the article stated. The IRT took on a new moniker - "Irritable Rapid Transit". 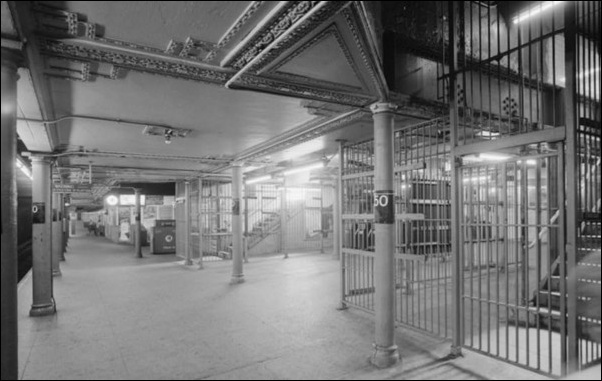 On July 2nd, 1976, the NY Transit Exhibit opened for business in the long-closed Court Street station in downtown Brooklyn. Originally planned as a temporary exhibit for the nation's bicentennial, it became a permanent museum. The mezzanine contained various exhibits and models; the platform level contained numerous subway and elevated cars from the museum collection. On July 17th, the first Nostalgia Trains began weekend runs between 57th Street / 6th Avenue and Rockaway Park, with a one hour stop at the Transit Exhibit. Service was supplied by the three D-Type cars 6019, 6095 and 6112, as well as a set of museum R-1/9s. The following year, on April 24th, 1977, the museum AB standards 2390, 2391 and 2392 would be used as well. Bicentennially-painted R-46 "1776" (680) sits in the New York Transit Exhibit, July 5, 1976. The exhibit would be come permanently known as the New York Transit Museum. Doug Grotjahn photo, Joe Testagrose collection. Even throughout the dark period of the late 1970s, there were improvement plans, many of which really were implemented. In 1976, the Transit Authority, as a cost saving measure, looked to discontinue the Franklin Avenue Shuttle, but neighborhood support for it always saved from being closed. One of the reasons for keeping it open, the neighborhood spokesmen would say, was to carry people to Brooklyn Jewish Hospital. In late 1979, however, the hospital itself was in dire financial straits. In 1977, the Linden Shop opened in Brooklyn, enabling the Transit Authority to prefabricate track panels indoors year-round. One of its first products was a 350-foot long by 40-foot wide diamond crossover installed just south of the BMT Jamaica Line at Queens Blvd. Prior to the plant's opening, track fabrication was performed in Westchester Yard in the Bronx and the 38th Street yard in Brooklyn. With the opening of the indoor facility, production increased nearly 50% over the previous year. The basis for today's subway map debuted at the Cityana Gallery on East 53rd Street on February 1st, 1977. The prototype had all lines drawn in red, which was not done when the production versions were released. This map would replace the London Underground style map created by Massimo Vignelli in 1972. Between November 1977 and February 1978, despite the snowy winter, 97% of trains were on time. In early 1978, it appeared that the Carter Administration was going to provide New York City with substantial Federal funds for modernizing its subway, bus and commuter rail operations. Perhaps with these funds, the 63rd Street line could be extended to Forest Hills by 1988, following the plans outlined in the "Program for Action". John G. deRoos, senior executive officer of the Transit Authority, felt his priorities were modernizing the existing system and completion of the Queens "super-express bypass" to Forest Hills. There was genuine hope that this could happen. President Carter also visited the New York Subway in September of 1979, and vowed to provide the funds to revitalize it. "New York's subway system is the senior citizen of underground rail travel - the IRT is 75 this year," Carter said. "But when Ed Koch and (MTA Chairman) Harold Fisher and I get through with it - with the tools we are fighting to get Congress to give us - it won't look a day over sweet 16." Despite the fiscal issues and uncertain funding, construction of the 63rd St subway continued on. Originally planned in the 1968 "Program for Action" as 40 miles of new subway for Queens, it had been reduced to 15 miles - the section under 63rd Street to 21st Street / Queensbridge, and the new subway under Archer Avenue to Parsons Blvd. The 21st Street / Queensbridge station was not in the original plan - it was added only after Queensbridge residents complained loudly enough to get it. Transit advocates at that time felt that the 63rd Street subway, in particular, would benefit very few people. The Transit Authority felt that people could be convinced to leave the E and F trains along Queens Blvd and transfer to the new line in Queensbridge. (The transfer would involve walking a block or two to the new line.) On August 8th, 1978, the federal government gave New York City $134.5 million in transit grants, most of which was slated for the 63rd Street line and an underground connection between the IND Queens Blvd line and the new station in Queensbridge. It was felt that the line could be open by 1981. Construction on the Archer Avenue subway continued, too. 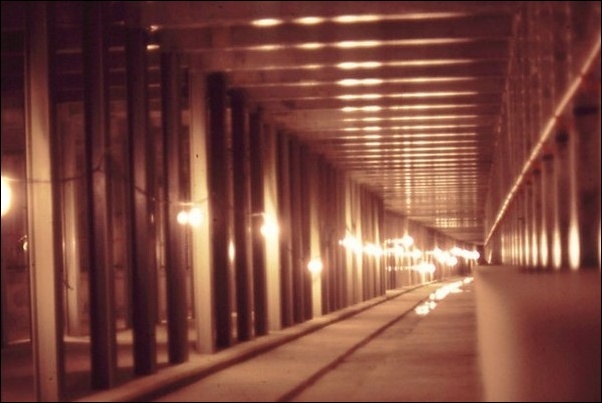 The holing through of the Archer Avenue subway tunnels occurred on December 14th, 1977. 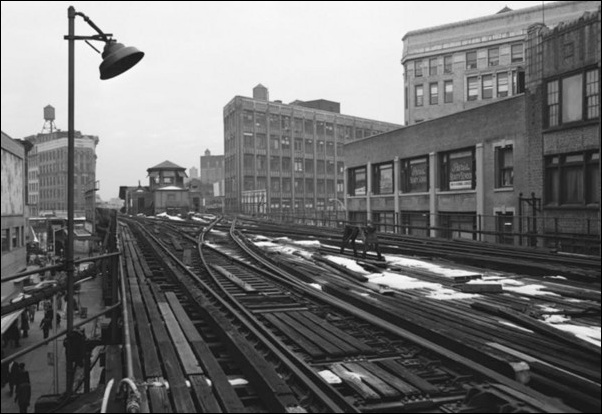 On October 1st, 1979, groundbreaking for a 1,300 cut and cover section of the Archer Avenue line occurred. This section also included the Jamaica / Van Wyck station. Construction was supposed to be completed in early 1984. By June of 1978, it was expected that 120 IRT cars would be retrofitted with air conditioning. 1,350 retrofitted IRT cars, about half the fleet, were expected to be completed by 1980, then revised to 1982, financed by a $35.3 million program with city, state and federal contributions. The remaining half of the IRT subway cars would be retrofitted or replaced outright by 1990. Subway cars were bring inspected every 7,500 miles, and the air conditioning systems were checked eight times between June 1st and Labor Day. The seeds for converting the original IRT City Hall station into a restaurant were sown in October of 1978. Phyllis Cerf Wagner, the head of the beautification committee advising the MTA, led numerous excursions into the station with city officials, and expressed her desire to make this conversion. A glass partition would be installed at the platform's edge to cut down on the noise and prevent restaurant patrons from falling onto the tracks. The Transit Authority introduced the "Train to the Plane", the JFK Express, on September 23rd, 1978. Even though the ride was more comfortable aboard new R-46 subway cars, and a premium fare was charged ($3.50), the JFK Express usually took longer to reach the airport that the A train did. The service was not popular with airport passengers, but did become popular with residents of Howard Beach, Queens, who felt that the premium fare was worth the comfortable trip to and from work. Trains operated from 57th Street / 6th Avenue to the Howard Beach station of the IND Rockaway Line on 20 minute headways between 6AM and 11PM. "The Train to the Plane", a three-car set of R-46 cars in JFK Express service, at Howard Beach-JFK Airport station in September 1978. Photo Doug Grotjahn, Joe Testagrose collection. The Sunday half fare program was abolished in 1979 as an attempt to save the TA money and avoid a fare increase. The fare would eventually go up with the half fare no longer in effect. Other cost saving measures that were recommended in 1979 were the closing of some token booths at night, and allowing the sale of tokens at supermarkets and banks. 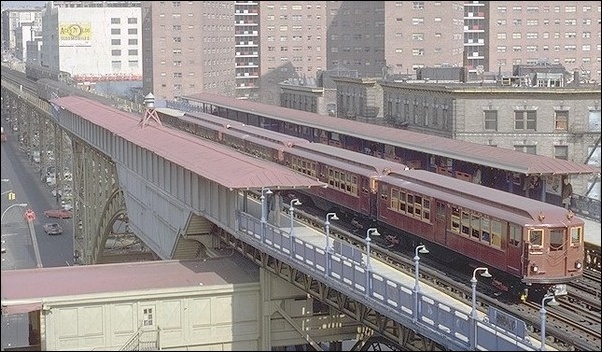 Noted subway photographer Steve Zabel captures this rooftop view of the Diamond Jubilee IRT special train, at the IRT Contract One station at 125th St. (Manhattan Avenue), in March, 1978. Joe Testagrose collection. In some ways, it was a political event, too, where Governor Carey, Mayor Koch, MTA Chairman Harold L. Fisher and NYCTA Senior Executive Officer John G. deRoos pledged support for the maintenance and growth of the subway "over the next 75 years". "A Whole New Subway - Coming At Ya! It'll be clean, quiet, air conditioned, safe, cheap - and soon", headlined a multi-part Daily News series on the subway on the eve of its 75th birthday. For the first time in quite a while, there was light at the end of the tunnel. Every IRT car would be air conditioned, through a retrofit or a replacement, by 1990. All 460 stations would see some kind of improvement made to them between 1979 and 1984, at a cost of $304 million. Eighty four of them would be completely reconstructed. Closed circuit TV would be installed to improve passenger safety. The completion of the 63rd Street subway to Forest Hills was projected to be completed by 1990. $1.7 billion over six years would come from the state, the Port Authority and federal grants under the Urban Mass Transit Act. Phyllis Cerf Wagner, the previously mentioned aesthetics chairman, announced "Operation Facelift", a new program where new paint, better lighting, increased platform seating and faster window and door replacement would make its way into the system. She was even thinking of getting rid of the subway concessionaires. Under her leadership, she persuaded the MTA to back off on painting everything silver with a blue stripe. There would be an "Underground City", a shopping mall of sorts modeled after Atlanta's Underground, that would stretch from Herald Square to 6th Ave / 42nd St and then to Grand Central. Connections to the existing IND passageways to Rockefeller Center would also be utilized. Worst subway station: Grand Central. Years of steady deterioration had taken their toll. That's why Grand Central was first in line to undergo rehabilitation. A three-year project would completely redo the mezzanine, for example. Worst elevated station: Metropolitan Ave on the BMT. Originally built of wood and resting on an embankment, fire destroyed it and it was made usable with temporary shoring. A two-year project to rebuild the station would begin. Worst Security - 42nd Street / 8th Avenue IND. It would be the first to get closed circuit television. (The Daily News claimed, in late 1978, that even transit cops were afraid to patrol the station). Worst Signals: The 7th Avenue IRT. They would be modernized by 1980 under a $17 million contract. Worst Cars (in 1978) - the R-10s. And not too much would be done about this in the near term. There was no funding to purchase new subway cars until the early 1980s, and that expenditure went to replace IRT cars first. Worst tracks: The Sea Beach Line in Brooklyn. As of 1978, there had been no work performed on the line since it was expanded to a 4-track open cut in 1915! 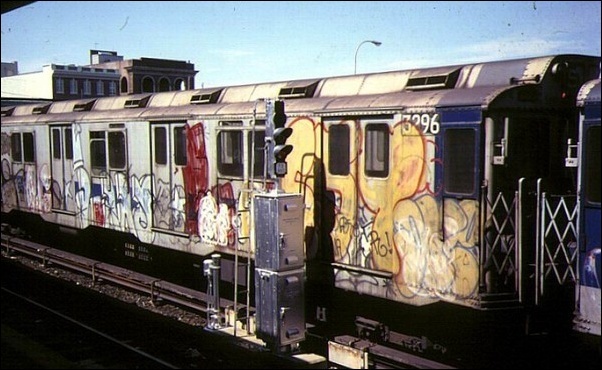 Voted "Worst Cars" in 1978, this train of graffiti-scarred R-10s rests at Rockaway Park Yard, September 1978. Photo by Bernard Chatreau. It is interesting to note that the Stillwell Avenue terminal, only now undergoing complete reconstruction, was slated to be reconstructed in 1980! The Daily News said that the terminal would emerge "with a bright, new airy look" and would be one of the first to benefit from continuously welded rail. While Stillwell Ave did get new rails and roadbed, it wouldn't happen until much later - into the early 1990s. While New Yorkers were receptive to the improvements, most didn't believe the TA would get the promised money. Part of this belief stemmed from the fact that the TA, at the end of 1978, still had not received the full $62.5 million allocated for the noise abatement program. Ridership during 1979 increased 4% over 1978 levels. Reasons for the increase were attributed to an improving economy. A City Planning Commission report recommended that free bus to subway transfers be implemented for passengers in Coney Island. Free transfers between the B-36 and B-74 bus routes to and from the Stillwell Avenue station were proposed. The study noted that this was the only portion of New York City that once had direct rapid transit service in a single zone which didn't get free bus to subway transfers when service was discontinued. (When Myrtle Ave, Culver Shuttle and Third Avenue El service was discontinued, free bus transfers were established.) The free transfers would relieve economic hardships of people living in Coney Island and stimulate full occupancy in the $200 million worth of government subsidized, recently constructed apartments. The study also felt that it would help integrate Mark Twain JHS and attract a stable middle class. For the Diamond Jubilee, on March 8th, 1979, a special run of the Lo-Vs for the press and invited guests traced the route of the first IRT line, as best it could since the "H" system was begun in 1918. 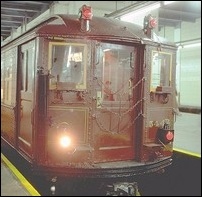 It ran from Times Square to Grand Central, south to South Ferry via the Lexington Avenue line, then north to 137th St via the IRT West Side Line. On March 23rd, after a special run of Lo-Vs across the Williamsburgh Bridge, they laid up at the Chambers Street BMT station along with the museum D-Types and AB Standards for public display until 6pm. (Chambers Street must have been in better shape 23 years ago!) During the summer, Nostalgia Trains consisting of D-Types, BMT AB Standards and IND R-1/9 subway cars ran on Saturdays and Sundays every weekend between June and November. For the Diamond Jubilee year, these runs were supplanted with the museum Lo-V train and passengers had choices of destination - Rockaway Park, Coney Island or the Cloisters. The fare at the time was $3.00 except for the trip to the Cloisters, which was $5.00. The trips to Coney Island ran in July and August only. Late in the summer, it was planned to have cross-platform transfers to the restored BU cars at Euclid Avenue for the ride to Rockaway or Ditmas Avenue for the ride to Coney Island. However, due to problems with the cars that could not be fixed in time, the BUs never ran in Nostalgia Special service. They did carry guests of the Coney Island open house held as part of the Diamond Jubilee in October 1979. Guests were taken about 1/4th of the way around the yard and back. The backbone of the Transit Museum fleet for the Diamond Jubilee. Left to right: IRT Low-V 5443, BMT D-Type 6095, and BMT Standard 2390, in fan trip service at Chambers Street. Photos L and R by Joe Testagrose, center by Doug Grotjahn. In May and again in October of 1979, the Transit Authority brought out the 5-car Lo-V museum set, and ran it in local service on the Lexington Avenue line between Brooklyn Bridge and 59th Street. A new subway token was minted in 1979 for the Diamond Jubilee, containing an off-center diamond shaped hole in it. One side of the token said "NYC Subway 1904-1979 People Moving People", and the other said "Diamond Jubilee Seventy-Fifth Anniversary". It also had an outline of a 1904 IRT subway kiosk on one side and a Gibbs car on the other. A real kiosk replica was placed on Astor Place and 4th Avenue that was used to enter or exit the IRT Astor Place station. Official festivities ended with a re-enactment of the trip around the City Hall Loop in flatcars on November 2nd, 1979. And just one month after "the whole new subway was coming at ya", a Daily News two part series questioned the safety of the subway. The statistics cited by transit police spokesmen of declining crime were being questioned in light of a rash of violent crimes on the subway in the last week of 1978. 1979 started off with six murders on the NY subway in the first two months of the year; in 1978, there were nine for the entire year. The Lexington Avenue Express was ordained with the dubious title of the "mugger's express". In February of 1979, a group headed by Curtis Sliwa, called "the Magnificent 13", began unarmed patrols of the #4 line between 8pm and 4am, in an effort to discourage crime. The Magnificent 13 eventually became the Guardian Angels, and would eventually expand their operations into other parts of the five boroughs. 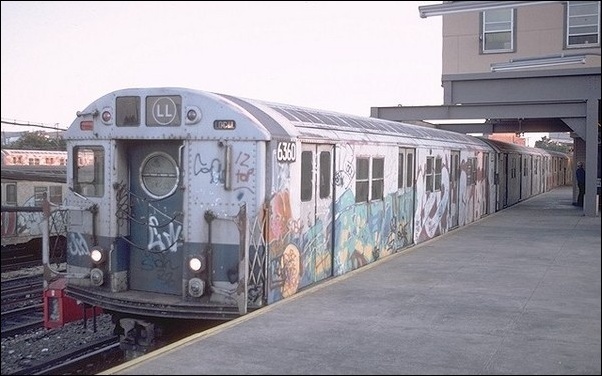 Ironically, "The Warriors", a movie about a gang's attempt to travel the subway between the Bronx and Coney Island while being taunted by other gangs and transit police, was playing in theatres just as a crime wave was overtaking the subways in real life. Transit Police Chief Sanford Garelik insisted that crime was not as bad as that on the streets, and it was the perception of rampant crime that was keeping people on edge. He even suggested that the fear was exaggerated because adults were not comfortable in close quarters with young people who are "loud, long haired and casually dressed". The assumption was that all young people were out to do crime. Movies like "The Warriors" didn't help disprove that stereotype. Finally, on March 6th, 1979, Mayor Koch asked the city's top law enforcement officials to devise a plan to counteract rising subway violence and to stop insisting that the subways were safer than the streets. Everything was relative; street crime wasn't exactly hovering near zero, either. Two weeks after Koch's request, top TA cops were publicly requesting Garelik's resignation because they claimed that he lost control of the fight against subway crime. Finally, on September 11th, 1979, Garelik was fired, and replaced with Deputy Chief of Personnel James B. Meehan, reporting directly to City Police Commissioner Robert McGuire. Garelik continued in his role of chief of security for the MTA. By September of 1979, just over 250 felonies per week were being recorded on the subway. The crime rate was far above any other mass transit network anywhere in the world. At the time, some cops on the beat were privately complaining that they were asked to look only for the high profile or more serious crimes and not the less-serious "quality of life" crimes. The problem, these cops said, was that by not going after the less serious crimes, you didn't establish a sense of order. One other issue was that the Transit Police radios and the New York City Police radios transmitted at different frequencies, and if additional help above ground was needed, it could not be summoned because no one above ground would hear the request. Subway patrols were also rigidly scheduled, and it wasn't long before felons (and even the general riders) knew exactly when police would be on their train, or at particular stations. The public perception at the time was that the war on subway crime was failing. In October of 1979, additional decoy and undercover units were deployed in the subway. The first cracked R-46 Rockwell HPT2 truck was discovered in March of 1977, just a few years after the R-46s appeared on the subway, when a transom arm cracked off its parent-side frame casing, causing a traction motor to fall onto an axle. The lightweight trucks operated under stress forces three times greater than what they were designed to handle. Filters were installed in test instrumentation when Pullman Standard, the builder, tested the trucks in 1973, and these filters were used improperly, masking stress forces. Skeptical TA engineers as far back as 1972 cautioned against the purchase of the Rockwell trucks. The result was that cracks developed in them, and these cracks could lead to a truck failure resulting in a derailment. R-46s placed on the Brighton Line were withdrawn after residents complained about severe vibrations. In addition, part of the 754-car order was very late due to a strike at the builder, Pullman Standard. The Transit Authority filed a $112.3 million suit against Pullman Standard and Rockwell International for damages for both the defective trucks and the late delivery. Rockwell in its defense claimed that TA specifications for stress tests on the trucks were lower than those the company wanted to run themselves. Allegations of bribery by TA officials to accept substandard subway cars was denied by the TA, but was investigated by New York City's Department of Investigation. When the R-46s were purchased, the TA did not buy a few samples of the trucks to test out on the subway first, which ran counter to its long standing policy to test out new components before making a bulk purchase of them. MTA Chief William Ronan had permitted the purchase without the initial test samples because he felt that the TA was pressured to get new equipment on the system. Years later, Manhattan Borough President Andrew Stein would accuse Ronan of making a highly suspect deal with Rockwell. By early 1978, the R-46s had 264 trucks with various cracks, gouges and sand holes in them. As these trucks were pulled out of service for repair, the remaining R-46s had to be inspected three times a week. To make matters worse, the remaining R-46s due in 1978 were delayed because of the Pullman Standard strike. In February of 1978, 889 cracks were found in 547 of the trucks. The cracking became so bad that on June 14th, 1979, Mayor Koch ordered 109 R-46s with trucks that had 2 or more cracks out of service. As of that date, 1,200 cracks categorized into seven different types were found to affect these trucks. The last of the R-46s were delivered in December of 1978, three years late. A report called the R-46s "the most troubled subway car ever purchased". A plan to allow Pullman to repair rather than replace the trucks was recommended by Senior Executive John G. deRoos, but questioned by many officials as it appeared that he was letting Pullman off the hook too lightly. The TA determined that welding the trucks would not resolve the problem, and wanted them replaced at whatever cost it required, which is part of the reason why it filed the lawsuit. The MTA ended up rejecting the deRoos-backed repair plan. In July of 1979, Pullman Standard informed the TA that the hand brake assemblies for the R-46 could be defective and they should be removed. The TA decided not to remove them; however, to acknowledge that there may be a problem with them, R-46s were withdrawn from any service that crossed the Manhattan Bridge; they were pulled off the Sea Beach Express. On July 30th, inspectors reported that steel was wearing away in the spot where the car body is joined to the truck, and that this situation could be potentially hazardous. By December of 1979, twenty other defects in the R-46 were found, and the Transit Authority filed another $80 million suit against Pullman Standard and a number of other subcontractors. This lawsuit voided a settlement agreement made with Pullman by executive director John G. deRoos for $1.5 million in spare parts to remedy the defects. It was the voiding of this agreement that led to deRoos resignation, amid criticism of handling this problem poorly. Also in late December, because so many R-46s were out of service, the Transit Authority removed 100 R-16 cars from storage, got them in running order and placed them in service on the subway. Only a few years before, it was the R-16 series of subway cars that were considered the least reliable in the system, and they were ironically taking the place of the newest cars in the fleet. The R-16s suffered from controllers that frequently shorted out, preventing the cars from accelerating. Initially placed into service in 1955, the R-16s were removed from service only 20 years later because of this problem. $200,000 was spent, in total, in sprucing up and temporarily repairing the R-16s. Just as the R-44 put St. Louis Car out of the passenger car business, the R-46 order put Pullman Standard out of business. Only the Budd Company was still left. The R-16 fleet past its prime in September 1979. Thanks to the R-46 truck problems, these cars were pressed into continued service even after they had been mothballed. Photo Doug Grotjahn, collection Joe Testagrose. 260 IRT cars, each being 64 feet long instead of the usual 51 feet (tentatively labeled R-62). $425,000 was already spent on the design of these cars. They would be air-conditioned but lack the sophisticated technology that plagued the R-44s and R-46s. The estimated cost of these cars was $190 million. 280 rehabilitated BMT / IND cars. "Inside sources" in September and October of 1979 claimed that many of the cars to receive the overhaul would be the R-16, and as part of the overhaul, they would get air conditioning. The estimated cost of this project was $98 million. A prototype refurbished R-16 (6429) was put on display at the 207th Street shop during an open house in September 1979. It even had a full width cab. 60 electric cars for Conrail costing $70 million. This would increase the Conrail fleet by 20%. 15 self propelled vehicles for the Hudson and Harlem Lines for Poughkeepsie and Dover Plains service, respectively. Cost was estimated to be $12 million. Creation of a West Side storage yard for the LIRR to reduce deadhead runs to storage yards on Long Island. Cost was $100 million. LIRR shop improvements estimated at $20 million. In 1979, repairs to the M-1 series of cars were made at the Morris Park shop, built in 1873! Of the proposed financing pie, metropolitan New York would receive the lion's share of $675 million. New York voters approved Proposition One on Election Day 1979 by a margin of 2 to 1. When Richard Ravitch took over the MTA shortly thereafter, he gave an address to the press in New York City and highlighted the fact that it was the temptation to take money earmarked for capital improvements and apply it to operating funds that forced the Transit Authority into its "deferred maintenance program" (and New York City to the brink of bankruptcy), and the bond issue proceeds would not be used to keep the fare at 50 cents. A fare increase, many thought, was just around the corner, even though Governor Carey pledged to keep the fare frozen until the end of 1981. Until 1973, an elevated highway ran along the west side of Manhattan called (appropriately enough) the West Side Highway. It was built between 1927 and 1931 between 72nd Street and Chambers Street, and then later extended to the Brooklyn Battery Tunnel when it was completed in 1948. A section of the West Side Highway at Gansevoort Street collapsed on December 15th, 1973, while under reconstruction. Engineering inspections determined that the roadway was unsafe and the elevated highway was closed from the Battery to 42nd Street, and later to 57th Street. An underground replacement called "Westway" was supposed to ease the traffic situation while at the same time making the Hudson River more accessible for recreation. A park the length of the roadway was to be built above the highway. For years, the proposal was debated and argued in the courts, mainly as to whether or not Hudson River fish would be displaced as a result of the construction, or whether the new highway would cause excessive amounts of air pollution. Proponents claimed that Westway would provide New York City with much needed jobs, more than those that would be created if the money was traded in for mass transit improvements. (At the time, some of the improvements identified were retrofitting older IRT cars with air conditioning, purchasing new buses, and rehabilitating stations and signals.) Soon the debate hinged on whether the Federal funds would be better spent on mass transit improvements. Then Mayor-elect Koch favored trading the funds in for mass transit, while Governor Hugh Carey wanted Westway built. Carey had promised a substantial package of mass transit aid if Koch were to change his mind and allow the project to proceed. In 1978, President Carter asked Congress for $50 billion for highways and mass transit projects, and this legislation would allow New York City to trade in the Westway funds for mass transit funds without penalty. On February 27th, 1978, Mayor Koch took federal transportation planners on a rush hour "tour" of the subway, pitching to them the need for more federal contributions. Koch told them that the NY subway carried 30% of the nations mass transit passengers during the morning rush hour but was getting back only 14% of the revenue share. $2 billion in Federal funds would be withdrawn if nothing was done by 1985. Before Richard Ravitch became MTA chairman, he was a staunch supporter of Westway. Once he became MTA chairman, his viewpoint changed because he felt the need to improve mass transit service for a greater number of people outweighed the need for Westway. As the 1970s ended, the West Side Highway was still closed with portions of it torn down, and still no decision was made regarding whether or not to trade the funds in for mass transit improvements. The following list is by no means all-inclusive. However, these incidents seemed have to been more "newsworthy" than others in the 1970s. 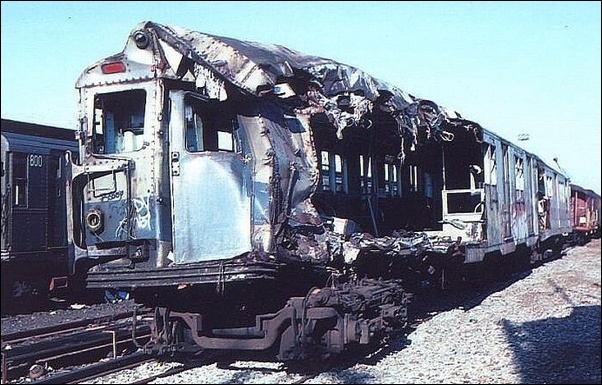 On May 20th, 1970, two people were killed and 60 were injured when an IND passenger train of R-40M cars (lead car 4501) on the GG and a disabled train of R-16s collided at a switch west of the Roosevelt Avenue station in Queens. The R-40M consist on the Brooklyn-bound GG left Forest Hills and developed brake trouble in the first and second cars. Passengers were discharged at Woodhaven Blvd and the brakes from the two first cars were "cut out". The motorman operated from the third car getting signals from the conductor, holding a flashlight, from the front of the train. The R-16 GG train, which had been diverted to the express track to get around the disabled train, was switching back to its normal track south of the Roosevelt Avenue station as the disabled train was approaching the same switch. Because the first two cars were "cut out", the automatic tripper did not cause the train to make an emergency stop, and the disabled train crashed into the diverted GG train at the switch. This crash was the first fatal crash on IND tracks since the IND started operations in 1932, and the first crash with fatalities going back to the 1927 IRT derailment at Times Square. A thorough investigation of this accident resulted in many changes to rules and procedures that had been in place for many years. On March 20th, 1973, IND Rockaway Service was curtailed due to a sinking pier found south of Broad Channel. This pier had been retained from LIRR ownership of the line. Slow orders, then limited shuttle service and bus shuttles through the area commenced as emergency repairs were made. The line was back to normal operations by March 28th. On August 28th, 1973, one passenger was fatally injured when part of a concrete duct fell from the roof of the IRT Steinway Tunnel and struck the roof of the first car of a Queens-bound Flushing local. The tunnel was built in 1907 for use by trolley cars and retrofitted for IRT subway car operation in 1913. The duct was removed and the cables that it carried were placed under the roadbed. On October 25th, 1973, service on the IRT Pelham Line was disrupted for several hours when a controller exploded on a Pelham Bay Park-bound 6 train in the early evening near the Longwood Avenue station. The explosion caused a fire, disabling the train. The express train behind it ran into extremely poor visibility and rear-ended the disabled train, causing minor damage to some of the cars on that train. Passengers were evacuated through the two trains, into the tunnel, and back to the Hunts Point Avenue station. Power to all three tracks was shut off for a few hours until the damaged trains could be cleared. On July 16th, 1974, a fire at the Metropolitan Avenue terminal of the Myrtle Avenue line destroyed a four-car length strip of the station. Four R-27/30 cars were severely damaged and needed to be towed out of the station. A train of R-32s evacuated from the station suffered minor damage. On August 20th, 1974, a fire in the Clark Street tunnel just before the start of the afternoon rush disrupted IRT service and caused quite a commotion. Panicking passengers walked the tracks to escape, even though the fire was extinguished quickly, necessitating the power to be shut off until 7:45pm. Lack of radio communication to the passengers was blamed for the panic, and the cause of the communication failure was cars in the R-12/14/15 class being on the ends of the train, lacking a PA system. As a result, these cars were subsequently placed in trains where they would be in neither the conductor nor motorman's position. The TA then began a program to install PA systems on all its cars. Further investigation of this incident showed additional incompetence, including a trainmaster who dialed his own number trying to reach the Fire Department! Oddly enough, the following day, August 21st, another train nearly stalled at the same spot, almost causing panic again. On December 1st, 1974, a southbound train of R-32s on the Franklin Avenue Shuttle derailed in nearly the same spot and hit the same wall as a doomed elevated train that was the Malbone Street Wreck on November 1st, 1918. The first truck of the first car negotiated the switch to the northbound track near the portal properly, but the second truck did not, staying on the southbound track. The switch had moved under the train because it was hand cranked and not clamped down into position. Car 3669 was damaged and could not be repaired. Service was suspended for a few hours, and single-track operation was run at night. Service was fully restored the next day. R32 3669 on the Franklin Shuttle, December 1, 1974. Doug Grotjahn photo, Joe Testagrose collection. On April 24th, 1975, 12,000 subway riders were trapped underground during the evening rush hour when an electric cable fire knocked out IRT service. 12 people were taken to hospitals and treated for smoke inhalation. On December 28th, 1977, an F-train rear-ended an E train that was about to pull out of the 5th Ave / 53rd Street station, injuring 30 people. The motorman, Everett Foy, claimed to have blacked out when the accident occurred. He had previously been suspended twice for overrunning red signals. The second car of an A-train consisting of R-40M cars derailed at Euclid Avenue on July 6th, 1978, injuring 5 riders. One of two electric motors used to power the wheels of the derailed car was found on the tracks. It wasn't clear if the motor fell off the car and caused the accident, or if the accident caused the motor to fall off. 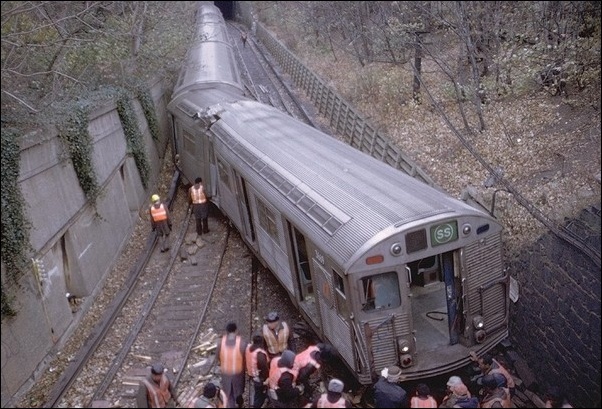 On December 12th, 1978, 21 people were injured when an IND CC train of R-10 cars derailed just south of Columbus Circle. A steel support girder nearly sheared one car in half. The cause of the accident was traced to vandals setting a handbrake in the 6th car, causing the wheels to slide along the tracks, expand due to friction and finally jump the rails. Cars 3274 and 3333 were severely damaged. This accident was similar in nature, but more devastating than, a derailment 7 weeks earlier on October 27th on the IND Rockaway Line between Broad Channel and Howard Beach. That accident was blamed on "wheel failure". R10 3333 in Coney Island Yard two years after the accident of December 12, 1978. Photo by William Mangahas. In the news during the summer of 2002 was a report about a sick passenger that died on an Amtrak-run commuter train in Boston because the crew did not stop the train to obtain aid for the individual. The Transit Authority also experienced a similar type of situation. On December 18th, 1978, a passenger boarded a Manhattan-bound M train at Neck Road on the Brighton Line and suffered a heart attack. The motorman radioed the Transit Authority about the sick passenger when the train arrived at Avenue U, and was told that the police were expected to respond at Avenue M. As the train proceeded to Avenue M, the motorman sounded the horn to indicate that there was an emergency situation on board the train that required police assistance. There was no police to be found at Avenue M, nor any other station along the outdoor portion of the line. The train ended up traveling all the way to DeKalb Avenue before a rescue squad met it, but by that time, the passenger had died. Other passengers aboard the train were irate that it was not stopped and held at Avenue U to await aid. Transit Authority procedures at the time were being followed, and an investigation was launched into why there was no police response at Avenue M. Police stationed at Prospect Park were sent to Botanic Garden on the Franklin Avenue Shuttle due to a report of a disturbance, and could not respond to the train. Officers at Church Avenue did not hear the radio call requesting assistance. The investigation also revealed an eight-minute breakdown in radio communication, where both Command Center and the Kings Highway tower were trying to contact the motorman, while the motorman was trying to contact them. The conclusion of the investigation was that both the wind and a nonchalant attitude by transit employees led to the passenger's death. The wind dispersed the sound of the distress signal the motorman was blowing. The report of a "sick passenger" did not give any clues about how gravely ill the passenger really was. On January 2nd, 1979, there were two separate incidents where passengers intentionally delayed trains in order to summon help for sick passengers. In one incident, the conductor and motorman were arguing over who should call for help. In the other, a conductor was informed about a sick passenger needing medical attention, and instead of stopping and staying at the nearest station, he closed the doors and the train proceeded to the next station. Passengers stood in the doorways and did not allow the doors to close until help arrived. A derailment on the IRT West Side line at 238th Street occurred on February 23rd, 1979. The third car of a 10-car southbound train derailed as it was traveling over a switch, taking the fourth car along with it. Damage was minor and there were no injuries. On March 8th, 1979, a fire broke out beneath an IRT Broadway Local at 125th Street, injuring four people and forcing the evacuation of 200 others. Sparks from a metal fragment ignited wooden railroad ties. A rescue train was brought in behind the stalled train to evacuate the passengers. Also on the same day, service on the BMT between 57th Street / 7th Avenue and Queensborough Plaza was suspended in order to identify the source of a gasoline odor, traced to a leak from a taxicab company garage. On September 10th, 1979, more than 2,000 riders aboard a West Side IRT train under Lenox Ave were evacuated due to a fire which broke out between the 96th Street and 110th Street stations. Passengers had to form a human chain to walk along the tracks to emergency exits. 28 people were injured. On November 18th, 1979, a movable platform used by bridge inspectors and painters derailed from its track beneath the Manhattan Bridge, closing the bridge for 8 hours until the platform could be shored up. As the "traveler" was moving, the tracks bent under the load, derailing three of the four wheels that kept the traveler on the track. The workers on the platform jumped to the bridge deck without injury, while only one wheel was holding the traveler in place. On November 27th, 1979, an "F" train of R-46s traveling light towards Coney Island Yard derailed just south of the Kings Highway station. As the train was switching from the local to the middle track, the 7th car derailed. There were no injuries and service between Church Avenue and Coney Island was suspended for four hours. Three other incidents involving R-46s on the same switch occurred over the next three months. On December 5th, 1979, 200,000 riders were delayed during the morning rush hour when a water main break in a 109-year-old pipe in lower Manhattan disrupted service on the IRT 7th Avenue and Lexington Avenue lines. Service between Wall St and 14th Street was suspended on the IRT 7th Avenue line, and service on the 4, 5 and 6 lines was severely disrupted. Service was backed up all the way into Brooklyn. In 1976, a transit strike planned for 5AM April 1st was averted when a $57 million settlement was reached between the Transport Workers Union and the MTA. While it provided for cost of living adjustments, it did not contain any wage increases. The MTA planned to "finance" the increases through increased productivity, but because New York City was in a fiscal crisis and being partly managed by an emergency financial control board, this board disapproved of the contract, and in fact was able to persuade the attorney general to consider it illegal. The TWU accused the TA of bargaining in bad faith and threatened to strike on July 9th if the increases were not paid. The City's position that a contract like this would be a very bad thing because of the poor fiscal status of the City, and the TWU and MTA ended up making another agreement that satisfied the emergency financial control board. In 1978, New York City, having just come out of the fiscal crisis at the time Ed Koch became mayor, was not in a position to raise salaries. But that is just what the Transport Workers Union (TWU) was asking for. The real value of workers' salaries was less than what they had four years prior, and the TWU was looking to make up that lost ground. If their demands weren't met, there would be a strike on April 1st, 1978. The City argued that the union was inefficient, citing such examples as TA buses getting 1,518 hours of maintenance service annually, as compared to private bus companies giving their buses 1,025 hours of maintenance service. The City wanted to eliminate costly work practices and improve overall efficiency and productivity. It came down to the wire, as the TWU authorized a strike on March 27th. Intensive negotiations in the final days led to a settlement, where the average subway worker would get a one-time $250 "bonus payment" as a deferred cost of living adjustment, and a salary hike of $1,261 over the two year contract. The 50-cent transit fare would also be maintained for another year. 200 part time token booth employees would be hired during rush hours to man booths that had been closed as a cost saving measure. The city felt that this last concession was a major win because it set a precedent for a contract amendment that would permit part time employees in the transit system. As a prelude of what was to come when this transit contract would expire, LIRR employees went on strike in late 1979 to get better wages. Chicago was also hit with a transit strike. The LIRR strike was ended because President Carter invoked a 60-day cooling off period, even though labor and management were far apart from settling. The fiscal crisis was becoming a memory and municipal and transit unions would no longer accept meager wage increases. This would also put pressure on the 50-cent fare, because any wage increases that the union wanted were not included in the Transit Authority's projected $200 million deficit. Physicists told symposium attendees of the American Association for the Advancement of Science that trains consisting of 200 cars would rocket passengers across the country underground at speeds of up to 14,000mph. The "subway cars" would be large vacuum tubes and would ride a wave of magnetic fields in a manner similar to surfboards riding waves. The fare would be about $1 a minute (there would never be any delays) and one main line with two feeder lines was proposed - from New York to Los Angeles via Dallas, with feeder lines from Chicago and Cleveland. The trip from New York to Los Angeles was estimated at 54 minutes costing $54, running at about 6,000mph, such that people's weight would not increase at the higher speed. (And you thought the $1.50 fare was expensive!) Trains would run on a one-minute headway. On December 29th, 1978, the NYC Department of City Planning released a report to Mayor Koch that recommended that the NYC subway be rebuilt and given a new name - "Metro". The report, acclaimed for its conclusions on construction needs and operational changes to make the subway look and run better, did not say how the City would come up with the funds necessary to make this happen. The "Miss Subways" campaign started in May of 1941 as a way of "beautifying" the subways. It ended in 1976. The subway information number, (718) 330-1234, went into service on October 7th, 1974. The Roosevelt Island Tramway began service on May 24th, 1976. The cost to ride it was 50 cents, payable as a subway token, even though this was not run by the TA. To discourage non-residents of Roosevelt Island from riding the tram, tokens were not sold on the Manhattan end. The agreement with the tram operators was that the cost to ride the tram would have to go up, and be above the cost of a subway token, once the 63rd Street Line opened for service. Fortunately for the tram operators, they had a monopoly on this service for 12 years. 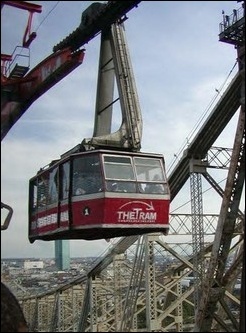 The Roosevelt Island Tram in 2001. Matt Richman photo. The Myrtle Avenue Elevated was terminated on October 4th, 1969. Demolition of the structure began in late August of 1970. By January 1971, most of the structure west of Broadway was gone, with the exception of some pillar stumps and part of the bridge across Flatbush Avenue Extension. On July 1st, 1971, the MTA took over the Staten Island Rapid Transit from the Baltimore and Ohio Railroad by forming the Staten Island Rapid Transit Operating Authority (SIRTOA). This line couldn't be merged with the Transit Authority because it was under federal railroad transportation rules. Did you think that semaphore signals disappeared from the subway system in the 1950s? Think again - the last semaphore signals were removed from the East 180th Street yard on October 4th, 1978 - 9 years after the Myrtle Avenue El was abandoned. The current map color scheme for subway train designations began in June 1979. It replaced the multi-colored scheme adopted when the Chrystie Street connection opened on November 26th, 1967. With the new "millennium cars" all coming in with red LEDs in front, many of these color designations will continue only on the maps. The frequent Nostalgia Specials often visited the Rockaways, as seen in this view from atop the South Channel Bridge in June, 1977. Steve Zabel photo, collection of Joe Testagrose. An undated description of the New York City Transit Authority, and a historical timeline of important subway events, issued by the Office of Public Affairs sometime in 1977 or 1978. The bulk of this article's contents were comprised from hundreds of news articles in the author's collection clipped from various New York newspapers dating back to 1975. Version 1.0, 19 November 2002, Copyright © 2002 by Mark S. Feinman.